Note: Paste is giving away 10 free uKeg systems in a contest ending Sept. 12. To enter, simply click here and fill out the contest fields. Sometimes I come across a beer I like and want to bring home, but it isn’t bottled, which means it’s time for a growler, another thing I have a ton of. 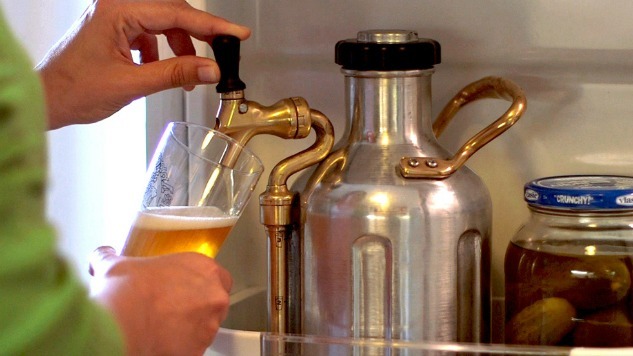 Growlers have just one problem: once you open a growler, you better be ready to drink it. All of it. I tend to share the beer I bring home, but after a pint, I often want to move on to something else from the collection. Fast forward to the end of the week, and what was left of my precious growler cargo is flat, or definitely not quite as good as it was when I originally brought it home. It’s something that started happening often enough that I stopped filling growlers. Wasting good beer is a crime, right? Now one new growler might have me getting fills more than I ever did before: uKeg. The tiny keg of sorts allows you to put those 64 ounces of precious brew under pressure, so it stays fresh much longer. It’s the best thing I’ve seen for growlers since I came across my first counter pressure filler. Counter-pressure can be awesome when you want to take a beer home and wait a little while before you crack open the bottle, but if you’re like me and have a glass early on, then this is (in my opinion) one of the best ways out there to make it stay fresh for a while, in part because you never have to open it thanks to the tap. The way it works is pretty simple; you essentially just fill it up just like you might any other growler, but before you close the lid, pop in a CO2 cartridge in the top. They’re the same thing you might use if you ever made your own whipped creme. Once the growler is closed, you turn a dial at the top to set the pressure inside, and voila, you’re ready to go. If that sounds complicated, here’s the folks at GrowlerWerks, the people who made the uKeg, breaking it down for you on YouTube. Things get really cool when it’s time to drink it. Instead of opening the top up and exposing your precious beer to oxygen, you instead open up a tap on the side and pour a pint out just like you might from a kegerator. It’s super cool, and will definitely make you the toast of the group when it comes party time. Right? GrowlerWerks originally raised money for the uKeg on Kickstarter. Back then, you were able to score the stainless steel edition (and a custom tap handle) for a pledge of $79. Now, you can buy the uKeg outright, but you’re going to pay a little more (common for Kickstarter projects). The stainless steel version is now $139. You can also score a copper-plated one for $159, or pre-order a stainless steel version of the 128oz model for $199. Before you say it, yes, that’s a TON to spend on something that’s typically $20 or less. That said, if you’re routinely pouring out even a pint from your growler, it will likely make up for itself pretty soon. Plus, stainless steel will handle the bumps and bruises of life a heck of a lot better than a glass bottle (I say this as someone that may or may not have shattered a growler in a parking lot while tailgating with friends.). It’s certainly not your everyday growler, but when you want to bring home some of that expensive sour, or a bourbon barrel-aged stout you can only handle 6-8 oz. of at a time, it’s going to be epically invaluable. Note: Once again, we’re giving away 10 of these bad-boys with Paste branding, absolutely free. Just click here to enter the contest.